There was no sweetness. There were no flowers. And the only thing that was stolen was my breath. What began as a restful few hours between a long day and an abbreviated sleep turned into a rolling profusion of expletives followed by a few moments to regain my sense of composure. On any other occasion, these moments could have been used to describe a much more pleasurable evening. What really happened will live in my mind, and my nasal cavity, for years to come. It was a routine outing. Callaway never strays far from the house for her late night relief before bedtime so I didn’t think twice about opening the door to let her out. But I certainly thought twice about opening the door to let her in when the pungent stench of skunk met the sensory cells of my nose. She looked extremely pleased with herself and I’m certain she sensed that I was not so pleased. I scoured the cupboards for the age-old remedy of tomato juice but came up empty-handed. I glanced at the clock and it read 10:30 pm, so a trip to the local, small town grocery store was out of the question. I then relied on the only endless source of information I had readily available – Facebook. As much as I have expounded in great detail about this social media icon being a complete mind sucking website – it became my lifeline and my hero. After a bath of Hydrogen Peroxide, baking soda and dish soap, the putrid odor dissipated to the point that I could tolerate her and allow my dog to come inside. Since I would never leave her out at night, I wrapped her in blankets to help her dry off and put her to bed. The “lovely fragrance” still lingers on my dog and in my house. And I’m sure it will be a phantom smell that follows me for months. But I have since forgiven her for the reminder that she is more canine than human, and she has forgiven me for forgetting that she is a dog and that she will continue to behave as a dog. 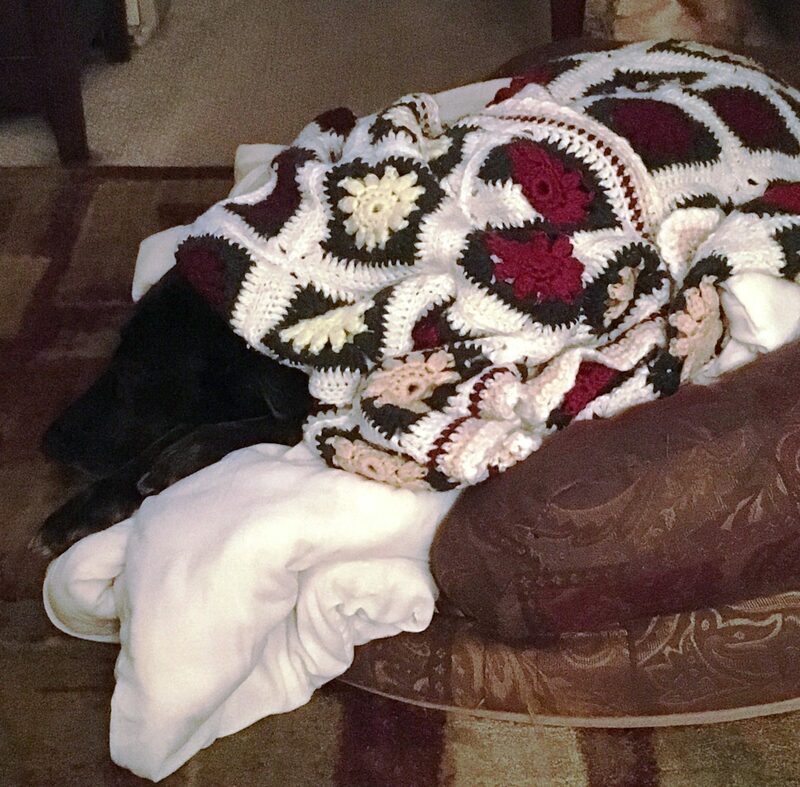 Lessons learned…..and from now on, we walk together….Callaway on a leash, and me with a flashlight looking for any eyes in my peripheral that may pose an olfactory threat! ← I’ll have what she’s having…. Oh no! My sister had a family of skunks set up residence in their crawl space. Needless to say, it took weeks to get the smell out of the house. That afghan is beautiful, Susan! Oh dear! One of my dogs loves rolling in ‘dead things’ sometimes on our daily dog walk so I know exactly how offensive a bad smell can be. How are you? I’m on a visit of the blogosphere. Survived a very long summer! How are you doing? Pretty good! I’m a grandfather now – grandson is 9 months old. That keeps me pretty busy. It’s been a busy summer. I’m looking forward to some down time and some more writing. I miss this blogosphere… but for personal reasons, I haven’t been writing on this blog. It’s good talking to you! Shoot me an email sometime. Will do….it will be nice to catch up!